Intro_##.gh Grasshopper Workshop Series in Poznań. Intro_##.gh is a cyclical workshop-like event taking part at the Object office in Poznań, Poland. This event's intention is to provide a relaxed and flexible tutoring experience, with only one goal—getting to know Grasshopper better. We will start with a very exhaustive introduction, then venture into the computational geometry world in whichever direction we like. The long duration of the series (with a possibility of extension) will enable each participant to come up with their own research problems during the learning process. The scope of those problems will have a major influence in setting the direction of each workshop. 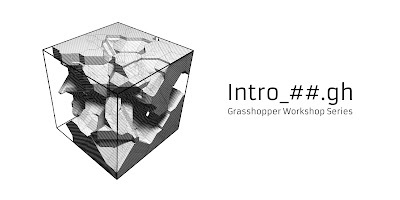 While a couple of initial meetings will be solely spent on Grasshopper basics, the latter part of the series will have a more open character. Each meeting day starts at 10 AM and lasts till 5 PM, with an hour-long break for lunch (14 hours of tutoring per meeting).